In 1859 – four years after the dogma of the Immaculate Conception what declared by Pope Pius IX and one year after our Lady appeared to Bernadette of Lourdes revealing herself as the Immaculate Conception – a miracle took place in the woods of Wisconsin just fifteen miles northeast of Green Bay. The Blessed Virgin Mary appeared to a young woman named Adele Brise and gave her both message and mission to carry forward. A shrine was built on the site, which has become known as the National Shrine of Our Lady of Good Help and it is the only approved Marian apparition site in the United States. That’s my first stop on Marian Pilgrimage: Discovering Mary Across the USA and it will take place on June 23, 2017. You’re invited to come along with me as I explore and experience the shrine, learning about its history and taking in the beauty of the place and the mystery of the Marian apparition that occurred there. Perhaps I’ll meet some interesting pilgrims there or uncover some little-known facts about the apparition and shrine. No matter what I discover, I know it will be wonderful. I’m also planning on stopping in at the Relevant Radio studios in Green Bay. I’m sure that visit will be filled with pleasant surprises as well! As I go, I’ll be posting on social media about my adventures and blogging about it once I return home. 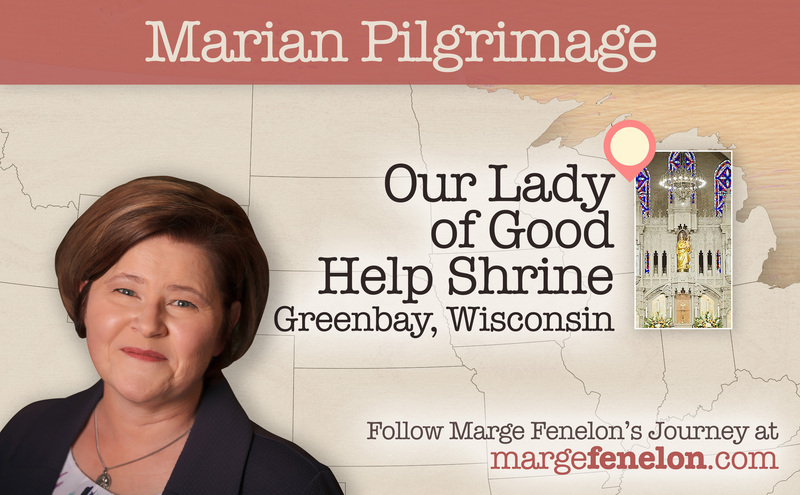 In the meantime, mark June 23 on your calendar, grab your backpack, water bottle, and rosary and get ready to discover Mary in the Great Lakes bay area of northern Wisconsin! Blessed Virgin Mary, Catholic Church, Marian Pilgrimage. Bookmark. Surprise! Coming May 31, 2017! Please pray for the needs of our family and extended family that through all we do, we do God’s will and grow in holiness and virtue growing in our intimacy with the Our Lord Jesus!! Thanks for taking my petition to Our Lady of Good Help Shrine! Please pray for my son,Andrew, and his family to be open to hearing the Truth about the Catholic faith and their return to the Catholic Church; all families that have lost loved ones to the faith; our daughter’s desire to do God’s will and to be blessed with a faithfilled Catholic husband; our son Michael’s vocation and discernment. Thank you and God bless your journey!